The focal point is the huge Union Jack, tightly cropped, billowing majestically from the tail, accented by a blue underbelly, blue engine nacelles, and a flowing ribbon behind the cockpit. The effect is understated, powerful, fluid, ideally suited for a jet aircraft. But what happens when you get it right, and yet, maybe it’s not right? 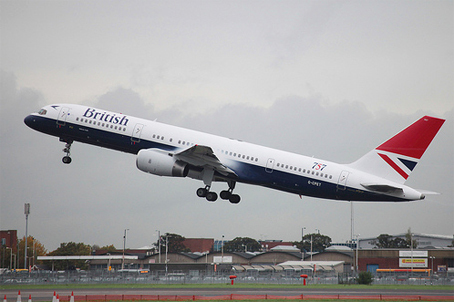 Last week I came across crankyflier.com and this photo of a new British Airways Boeing 757 in its retro livery from the 1980s . . . I love this. Different vibe, equally powerful. Same colors, same general scheme — the Union Jack (more abstract) on the tail, blue underbelly, name near the front. But where the modern look flows, the retro look stands — straight lines, crisp edges, sharply tailored, prim, proper, regal, uniquely British. No other country could pull this off. And that’s what you want in a brand — the thing that’s uniquely you. Let other airlines flow. Flow is an obvious choice, natural for aircraft, and it can be beautiful, as British Airways’ is. The downside is the risk of looking generic, which won’t (even can’t) be remembered. Besides, real things are not generic. Everything has a unique story. This is not a small thing. Just because we design something “professionally,” and just because it’s “working,” doesn’t mean we’ve found the right look, and if the customer remains uneasy, we need to dig deeper. The difference between these two schemes would have been extremely difficult to articulate beforehand and extremely difficult to design from a checklist of goals. Which is better? Here are two excellent designs living in that twilight zone that eludes both science and words. Our name for it is art. Give yourself and your client room for it. Logos and branding are hot issues right now. From the list on the left are our Design Talk posts that deal with logos . . .
Below are our print articles that deal in one way or another with logos and logotypes, from quick looks to extensive how-tos. Available individually, and all are on our Master Collection DVD. PDF 0613 | What typeface goes with that? This entry was posted in Branding, Design, Editorial, Logo design. Bookmark the permalink. 41 Responses to Is the right design the right design? I actually didn’t recognize either tail treatment as being the Union Jack. I’m an American and would recognize the flag in a normal setting. But the fact that it is comprised of straight lines and a very rigid-looking, geometric design makes the top treatment less recognizable due to being curvy and so fluid. I actually can’t even see how it is a cropped version of the flag. I’ve actually flown on British Airways before, too. I think that a native of GB would certainly be more familiar with the treatment because they would have been exposed to various graphic renderings of it over the years. But for this Yankee, it’s much less recognizable. Hi Pat! Here’s some visualization help. Ah, now I see it! That’s the advantage of the stars & stripes. A star is a star and a stripe is a stripe, even if in a completely different context — like Captain America. Whereas a bunch of crosses superimposed on each other have to be shown in their entirety to be clear what they are. A very interesting article — and very timely for me! I’ve just started designing/revising an airline flag/logo (purely as a design exercise for myself) for an airline that was rising fast in the 60s but has fallen very far today, and their logo reflects it — it seems small, cowering, and singularly uninspiring. But changes are in the air, and redesigning their logo to regain that previous confidence is one aspect that I’m struggling with. I’m looking forward to all the comments — no better place to get the best design input than these forums! Well, I’m not so sure. The older design does indeed look stodgy and dated. Square. Rigid. I don’t particularly associate those qualities with Britishness. I don’t see the supposed-better appeal of the retro design, though I can certainly see how it fits with the past. “Flows” vs. “Stands”? Oooooookaay. So which represents what you’re (they’re) trying to say? Stands — on what? Principles? Or just a “gut feel”? And if the “feel” is dated, what’s really driving your response? Maybe Cranky is mistaking nostalgia for good design. They’re both good designs, both iconic for their times. But they do represent their times. I’d suggest the retro look’s time has come — and gone, right along with the knit-suit stewardess uniforms of that era, complete with pillbox hats. The retro design does not represent, to me, the sort of “Stands” which I think is being referred to: the British formality, the stiff upper lip, the dignity of parliamentary institutions and Westminster Abbey. It just looks typical of that era of airline livery, regardless of country and culture. But that’s my Stateside-centric viewpoint. Those closer to the matter (especially Brits) may have more to say on it. Any Brits want to weigh in? I’d argue that they “got it right,” really. The billowing, gradient-shaded flag clashes with the clean geometry of the airplane and looks quite out of place. One of the reasons the older livery works so well is that both the aircraft and the design are clean and simple; they go together. Worth noting, too, since you linked to those Pepsi posts, is that since the (ill-considered) revamp of their logo, Pepsi’s market share has dropped dramatically. They were #3, last I heard, behind Diet Coke. Your articles are always so interesting and thought-provoking! But this time I have to disagree on the BA design. I love the new one. I guess it boils down to whether Britain wants to be viewed as the Winston Churchill’s Britain or the Kate and Prince William’s Britain. I suspect the latter. I would tend to agree that the old logo is superior. Change for the sake of change doesn’t cut it. If the design was done right the first time, and I believe it was, then what is the point of change? The Chanel No 5 bottle hasn’t changed since the 30s, and it still serves the purpose well. I love the fact that you’re so particular in your discussion of design (I’m a big fan of your podcasts, too). It’s taken me a bit of going back and forth to really think about the differences. By its very nature, the billowing flag includes more “information,” which the brain has to figure out. Not the best choice, if you want something to be recognized quickly. But to me, what this story illustrates is the importance of marketing thinking preceding design. That is, what are the visuals of the brand supposed to represent? Yes, it may be difficult to assess which design will be the best, but that’s where testing comes in. There’s a lot of rebranding going on these days, and I wonder what drives the decision to do so. Is it the customer or someone inside the company that either thinks a redesign is going to fundamentally change a business and make it more successful, or are they just bored? I’m with Pat. As an American, I missed it totally. For me, then, I would have to say that both designs fail, although the newer one fails worse. On a related note, though not concerning airlines and jets, I recently noticed a total redesign of the packaging on my usual boxes of name-brand pink sweetener. I’ve saved an old box now for about a month, and left it side by side with a new one. I must say, I think the old one needed some redesign, but the new design effort is a fail. I’d love to talk with some experienced designers who read this awesome blog about that box redesign, too . . . I come to the design world through photography and website design, so my eye is perhaps trained differently from that of a traditional designer, but I have a well-trained eye, nonetheless. And I am learning something useful every time I receive one of your emails. Thanks for the pearls in my inbox; please keep them coming. As for the airline and the box, and photography, too (! ), it seems as though everyone everywhere is dialing up the Vibrance settings in Photoshop. Vibrance and oversaturation may catch my attention, but if I had a choice, I would buy another kind of sweetener — the box is hurting my eyes. I will soon start transferring the contents of that ugly new box into a different container and throwing the redesigned, oversaturated, over-vibrant mess into the trash as quickly as I can. I would throw that BA redesign into the trash too. Oh well, perhaps I’m just becoming a bit curmudgeonly now that I’ve turned fifty! I’d be wary of calling a design a “fail” just because you didn’t recognize a certain element. The goal of the tail design isn’t that you recognize it as a crop of the Union Jack, but that you recognize it as the tail of an airplane that could only belong to BA. As long as the tail of the plane said “British Airways” to you, I think it’s a success. Design is often layered, in that certain elements don’t need to stand out; they can be discovered over time, or even just subconsciously. Take the FedEx logo for example. If you don’t notice the arrow at first glance, it doesn’t mean that the logo failed. In fact, I would say the opposite, that because the arrow doesn’t stand out at first glance, the design is a success. Hitting the viewer with too many messages at once is where most designs fail. If you can manage to pack a bunch of messages into a design in a way that they appear simple, but are revealed bit by bit as the design is explored, that’s true talent, in my opinion. Flowing UJ = flames coming out of the tail. Tried and true stands the test of time. When I board a plane, I don’t think “Hey, I like their colors and their happy design.” I need to feel trust in the machine that I’m entrusting my life with for the next hours. And the old logo with the straight lines symbolizes more trust for me than the wavy one. With which, had I not seen it on a plane, I would make associations with swimming, not with flying. With the old logo, I make associations with a paper plane — properly built, it flies straight to its destination and will land softly. What I like about the new design is the smaller part of blue at the belly. It leaves room to place the brand name below the windows — where the passenger will read it when boarding and where spectators will see it when the plane starts and lands. I have the say that the old design is, well, old-looking and dated. The new design is fluid, it moves, it flows, just like a plane would, quite frankly. The old design is stale, it’s boring, it’s stationary, and it’s dated. It looks like it should be on a package of shortbread cookies; it’s just simplistic without being eye-catching. Retro works only if the design was powerful to begin with. I would contend that a billowing flag stands for all of the qualities that you bestow upon the British. The stoic, resilient people whose proudest moments are their darkest days. Just as the Stars and Stripes live in people’s minds in scenes where it’s worn, even tattered, cloth stands against adversity and in doing so inspires a future of good fortune. So here does the Union Jack. Of course, no one wants to ride in a plane that says tattered and worn, so here we have quite the opposite. The recast of the BA logo and wordmark does not dwell in a history that in fact only began as a merger in 1971 — barely a dot on the timeline of the British annals. For such a youthful organisation to convey such a dignified image that it inspires an audience to bestow such trust on it, usually earned over many more generations, tells me that they have done something right in both their graphic incarnations. The time was when everyone in Britain knew their place. No cheap upstart would ever dream of buying a plane ticket, never mind being able to afford one. Then came cheap holidays on the Costa Brava — and the next thing we know is that everyone thinks they’re entitled. Entitled to this, entitled to that. It’s a crying shame that we can’t all stand chins up and facing the foe with our solid, immovable Union Jack. The new logo is like a woman fluttering her handkerchief. Who designs these things? Probable someone with a secondary modern education and GCSE in art. By Jove, you do prattle on, old boy. Multiculturalism be damned. I for one am a culturalist, singular. I couldn’t agree more, old bean. Where are those stalwart heroes of graphic design when we need them? LOL to the flying circus signature line and tone . . . Interesting issue. 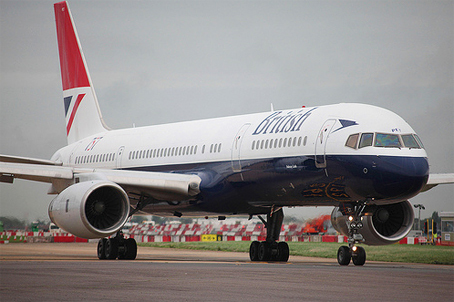 I agree that often redesigns are done for the wrong reason, but I like the new BA look as much as the old one. You are correct that the old one conveys that British sense of stiff upper lip, but maybe that’s no longer what Brits want to be associated with. Maybe they are responding better to a softer look. If that’s the case, the redesign would make a lot of sense from a marketing perspective. There is so much tension when it comes to design changes. When clients make arbitrary changes based on personal opinion or simply for the sake of change, that’s bad decision-making, and we have every right to complain. Doesn’t always help, especially when committees are involved in decision-making, or even an overbearing boss. I had one memorable case where, after nine months of strategically working with an internal marketing group on a large corporation’s annual report, the company chairman happened to see the printer’s proof. This was a day or two before final printing. The entire theme of the report was the incredible growth the company had experienced that year, so pictures of growing things featured prominently, as well as green backgrounds in key areas of the design. His first words, after 10 seconds, were, “Green? My wife hates green! I want the color scheme changed, now!” You can imagine what that did to the entire marketing team, not to mention our design team sitting, open-mouthed, watching that outburst. But sometimes clients have great reasons to make change, and I often see designers pushing back because the changes don’t fit with their perfect view of design. There’s always some compromise involved. In this case, I think we have to give BA some credit, and I’m pretty sure it was a carefully considered change. Not like the GAP disaster, which had nothing to do, to anyone’s knowledge, with any strategic direction for the company. In fact — as many British readers may remember — the reality of the rebrand was somewhat more complicated than a straight swap from old to new. The new “flowing” Chatham Dockyard Union Flag design was the one BA ended up with after a disastrous attempt in 1997 to move its fleet to a varied set of ethnic, World Art tailfins. Believing the old flag design to be “remote and aloof,” BA rolled out some 30 new multicoloured images onto 170 planes at a cost of £60 million and also incorporated the designs into boarding passes, ticket wallets, baggage tags and business cards. Almost all were universally decried as awful. 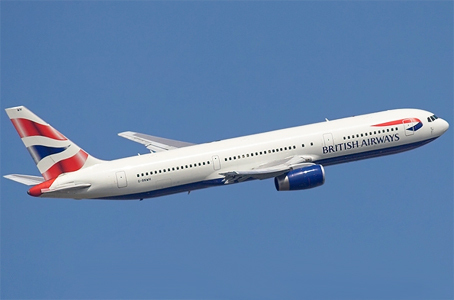 In the face of mounting criticism (and after competitor Virgin Atlantic cheekily incorporated the missing union flag into its own branding), BA cancelled the rebrand in 1999 and eventually settled on the single Chatham Dockyard design across the whole fleet — thus ending up with the best of a bad bunch. Some examples of the failed liveries and a more complete rendition of the sorry tale of “when design goes bad” can be found on Wikipedia and BBC News. Perhaps I should jump in here to say what I’d hoped was evident in the article, and that’s that I like the new look. I also like the old, which, if dated, is dated in the way that, say, Windsor Castle is dated, which is simultaneously ancient yet essential to the culture, vibe, and national identity of modern England. The point is that they both work, so the question is, how could this possibly have been articulated in advance, and how could you possibly have designed one over the other working from any kind of checklist? The implied answer is that you couldn’t, and that other jobs are like this, too, and so you have to leave time and space in your work for that elusive something we call art. An important consideration in brand design is, “who’s buying their stuff?” and being relevant to these buyers. A part of the modern buyer’s world is the whole 3D aspect seen across modern technology, so adapting to this has become important. Digital printing and onscreen reproduction allow for the use of gradients and what-not that were difficult to achieve in years ago but are cheap to produce, common and relevant today. That all said, the good idea is key. Perhaps it’s even stronger than before as some of the new reproduction technicques actually give a lesser brand presence via these outputs. Just wanted to tell you that I am one of your greatest fans, on every level. I could go on and on in detail, but you’ve probably heard it all before. I appreciate the dedication you put into this particular issue. I agree with you; I would have asked the same question, “Why would an airline so established want to change its image?” As a graphic artist, I run into this a fair amount. I get requests from my clients like, “I need to change my logo.” The question is why? For the graphic designer who made the change, it was a fair amount of pocket change, but what concerns me the most is how did this change affect the airline? Was there a reason they wanted to change the image? Had their income decreased in the last years? Were sales decreasing? Before I embark upon a major change, I consider it ethical to do a fair amount of research. Not on graphics, no; I mean research as to what is in the public’s mind. “What do BA’s public think of BA? What do they think about the service.” Maybe there is nothing wrong, and maybe there is, but you will not find out unless you ask. And that is achieved through surveying, and surveying for good. If the company is doing good in their sales and production, a change of image can get them into a lower position economically. That is my first step: ask and then find out where should I move to. Hope this helps. Thanks again for the effort you put in making this planet a better-designed one. Reconsidering your corporate brand has its place. Usually by about seven years the brand can have less resonance with its marketplace: the buyers have changed, the brand itself has changed, or the market it’s in has changed. All relative considerations to keep abreast of. That said, if it’s properly constructed to begin with, you have less need to do so. I remember the manufactured outrage following Margaret Thatcher’s comments. One unnoticed point was that, theoretically, tailfin and body markings need to be big, uniform, and distinctive so they can be identified at a distance by ground and traffic controllers. There’s an interesting design constraint! Hard, straight angles seem to indicate they are more businesslike, more trustworthy, more dependable than the airplane with soft, curvy lines on its tail! Fly straight and get me there using trained people doing the work, those who pay attention to the lines. That’s what the sharp-edged angles and lines say to me! Susanne, that’s the theory apparently. But I don’t know if I agree in practice. How many times have I considered a purchase of anything based on corporate linework as the key factor? Hmmmm, nope, I can’t think of one, especially in a safe and commodity-type market where safety and service are a given and price is key. Craig, the effects of such subtle elements are rarely at the conscious level. But they impress us nevertheless. My first thought was: The new logo reminds me much more of holiday. The Serps just told me that about two-thirds of the air traffic is for holidays — so tourists are the most important customers for BA. I as a tourist prefer the new logo. The older one looks more businesslike to me. I see the sense of the post . . . only, I am not sure I agree with the example. Union Jack is both an emblem and a flag. The retro interpretation looks stiff and stagnant — and I don’t see how that’s a good thing if it refers to the British “stiff upper lip” (kind of). The flag interpretation is naturally fluid and adds that spiffy element of change and dynamism to the livery. I think the difference between the two is the difference between a monarchical emphasis and an emphasis on Britain as a contemporary, modern nation (without losing sight of her history and tradition). I think the “rightness” of a design is not determined only by historical stereotypes — it also needs to work in today’s world and feel right for it. I wonder if it’s just the changing attitude toward graphics — i.e., do we now think that they should do more? And, perhaps, has the technology of designing and physically applying the graphics enabled a livelier approach? Also, the problem for me with the retro version is that I see only the word British. Isn’t that a bit arrogant? (And I’m British!) Surely the name of the airline is British Airways. It’s not telling me the full story. Oh dear, design is so complicated . . . The bit of flag does look less clear somehow — the lower red stripe is a bit too broad and the upper one too narrow. Essentially, though, I see these as the same design with tweaks. I do prefer the new “British Airways” lettering — more classic. I think I prefer the old tail. I suppose the flowing one is probably more ephemeral — it may end up looking dated more quickly. The other one, being so plain, without “effects,” is more long-lasting. I prefer classic designs on transport in general. I totally get what you’re saying, and I agree with the logic of depicting the reserved, regal Britishness. But the bottom line is to get people to choose your airline to fly with, and what better way than to portray yourself as a friendly and modern airline? Their reputation is long-established, so reliability and professionalism are already facts with which most people are familiar. I remember the rebrand with the multi-ethnic tails. I loved it. I wonder if it was ahead of its time. In case the intention behind my earlier comment here (under the nom de plume of Col. S. Blimpington-Smythe) was not clear to everyone, I intended to express that Britain has very strong class divisions that have undergone a huge shakeup over the past forty years. The democratisation of air travel means that the passengers to whom the logo is addressed have changed. Therefore it is not just a question of changing logos with the times, but also to address a changing customer base. On another point, because I am English and know the Union Jack so well, it didn’t occur to me that showing only part of the flag on the tail fin might not be clear to everyone. That is surely a lesson for anyone designing a logo. Seeing as I am British, I feel I should point out that the flag is only called the Union Jack when it is flown at sea. It is in fact properly known as the Union Flag. From a design point of view, I like the idea of dropping the “Airways” bit of the livery. That bit is obvious (it’s a plane). Then the “British” becomes a statement. It’s about time us Brits were proud to be British again. I did like the older design, but feel the change to the older, more recognisable design is a strong statement of identity. Whew. This is lively discussion. Thanks to John McWade for reintroducing me to the term “livery” as descriptive of vehicle branding. I reluctantly admit I thought livery meant only servant uniforms of the Regency era, and this inspired me to look it up. Great delight in learning something new! Secondly, as to the design, I saw several references to the design of the airplane livery as influencing ticket purchases — I don’t think that is the case. Surely by the time one gets to the airport, one has already chosen an airline, right? Ticket is in hand, or on your mobile device, etc. That’s mixing up product advertising with the livery. Which leaves the designer of the livery to expand the brand beyond the marketing, right? American me recognized the Union Jack in it, but not which part. Which makes it a clever use of the branding. The 80’s version of the livery is very strong and distinctive and British — I do like that. I think that historic version is what draws me to visit Britain. That’s my 2 shillings . . .
For what it’s worth, whenever I see BA planes with the flowing logo, I think of the Norwegian flag first. I realize both flags share similar colors. There’s something about the old logo and its lines that more closely reflects the Union Flag. Look closely.